SHOPPERS looking to score some sweet deals on clothing in the Lincoln-Hamilton range have two options: clearance racks and thrift stores. It is possible at just the right post-season sales at Target, Ross or Kohl's to get some great outfits for very little green. But these sales are few and far between, and only prove fruitful consistently for sizes XS or XXXL. Enter thrift-store shopping. Thrift shopping is one of those activities that requires time and a willingness to dig elbow deep in other people's clothes. Think of it as the ultimate form of recycling—or better yet, up-cycling. It is often possible to find new clothes in next-to-perfect condition that other people never got around to wearing or outgrew. Sometimes, true gems can be uncovered. Case in point, my sister once dug up an honest-to-God 1960s Chanel caplet from a Pick and Grab bin, complete with original tags. It had a small grease stain that was easily covered with a pin, but for a whole $1.99, who cares? It was Chanel. Some rules apply. Come in with low expectations. For the most part, these are not great designer clothes, and many of them aren't even pretty or in great condition. You'll have to tap into your gatherer genes to find something you like, but when you do, you will be totally unique. Second, keep an open mind and look for potential. If that minidress with the mandarin collar is three sizes too big, think about paying the $4.50 and spending the other $30 on a tailor; getting clothing tailored isn't as much trouble as most people think. Also, recognize that sometimes the thrift gods are smiling, and sometimes they are not. Random stock is constantly coming and going. One day's midden of marvels is the next day's trash heap. Thrift stores can be a wonderful resource for finding high-quality clothes, household items and furniture that cost next to nothing except for time. I find that the best way to go secondhand shopping is to go in looking for nothing in particular. It's the thrift-store jinx: if you're looking for a blue dress from the '80s, all they'll have is red jumpers from the '90s. Remember to always do a very thorough look over the item before buying, checking for tears or stains. Finally, make sure to wash all thrift-store finds thoroughly before wearing. Staffed by a fleet of dedicated cotton-candy-haired little old ladies in aprons, the Thrift Box in Willow Glen offers some of the best deals in San Jose. It is run by the San Jose Auxiliary to the Lucille Salt Packard Children's Hospital in Stanford, and the sign on the wall at the entrance reads "Together, we are helping the children." This impeccably clean place is extremely well cared for, and the clothes are basic but in good condition. The best part? Jeans, shoes, shirts, almost everything seems to be priced $4. The front part of the shop is also reserved for seasonal items, like the current "Spring Boutique," which features faux flower arrangements and ceramic bunnies. Savers is the biggest "hard-core" thrift store in San Jose. This place is huge and grimy and mainly focuses on clothing and accessories organized into one gigantic swirling vortex of random goods. They also have a big selection of women's shoes, and their jeans stock goes on for rows and rows. My advice is to get one of the big beat-up shopping carts from the front and go aisle by aisle, loading up on eye-catching stuff—then take it to the corner changing rooms to try it all on in one fell swoop. The cliental is eclectic, ranging from mothers with kids to old ladies in crocheted hats to homeless men. Housewares are repackaged with all parts and sold in bags. This keeps them cleaner and all items together, but makes it impossible to test them before you buy, so purchase at your own risk. Prices are moderate for the thrift market, $10 for a good condition coat, $6.99 for a shirt. 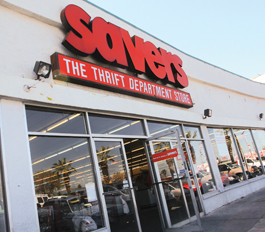 Savers also has locations in Salinas, Redwood City and Milpitas. The Salvation Army on Winchester is the best place to go for secondhand furniture and home goods in San Jose. The store boasts huge stocks of good-condition bed frames, cabinets, bedside tables and entertainment centers that would look virtually new with a little sanding and a fresh coat of paint. Appliances also abound, like working fridges for $150, big color TVs for $30, along with sporting equipment (tons of skis and exercise bikes). They even have good condition couches for about $250, all with stickers that say, "This upholstery has been professionally cleaned for your satisfaction." Their clothes section is small but dirt-cheap: $2.70 for shirts and $9 for jeans. A few years ago, Target and Goodwill Industries formed an unholy alliance to share merchandises, in order to reduce waste, they say. Goodwill agreed to take on all of Target's unsellable damaged items, seasonal items, customer returns and things that were just too plain ugly to sell. The result is that Goodwill, perhaps the best-known thrift chain around, now also offers the worst deals. Depending on what Goodwill you walk into, you may feel like you're in the clearance aisle of your local Target, with prices to match: $16.99 for an unused button-down target shirt, $14.99 for unused blazer that still has tags. The upside is that the item is technically new, and it is possible to find some weird items that didn't sell in bulk for slightly cheaper (who knew I needed an entire crate of citronella candles?). The downside? For clothes at least, you could probably find a better deal on the clearance rack at the Gap. The clothes at Unicorn Thrift Shop are above average in condition and quality and must be pre-selected from the donated heaps for their quality (no stains or tears here). This small charity thrift-shop's men's selection is lacking, but the women's area is organized and clean, and you can even come across some name brands if you look for them. All prices look to be under $10, other than the high-end vintage clothing that they set aside, which can run $20–$30. The Hope Station is perhaps the most methodically ordered thrift store around. The Fremont store has a new-arrivals section that's worth a look over, and the rest if the "departments" are clearly divided into accessories, dresses, jeans, etc. Prices are great, under $4 for a top, $8 for a pair of pants, $1 for dishes. On Saturdays, everything is 50 percent off until 1pm. Thrift Town is a massive store that is surprisingly well organized even if it smells a trifle musty. The clothing racks are arranged by item, size and color, even sleeve size, and stock rotates quickly. Check for sales; they often have half-off colored-tag deals. Thrift Town stocks a large selection of used books in good condition (not just old beat-up romance paperbacks) and a huge amount of accessories. Prices are exceptional: $4 for a two-piece suit, $7 for a purse. The store is huge so you will have to dig for your thrift treasures, which is part of the point, and the charm of thrift shopping.